I had completely forgotten about eggs and soldiers, one of my comfort foods as a child. 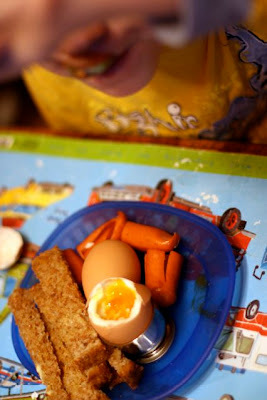 How is it, that my boy is 4 and half years old and he's never seen a soft boiled egg? This breakfast took a little convincing. Even though he's best friends with the hard boiled egg he looked at me incredulously when I suggested he try it. But we caught him on a good day and he quickly became a big fan. Place them in a pot of cold water. Bring to the boil and cook for 1 1/2 minutes. 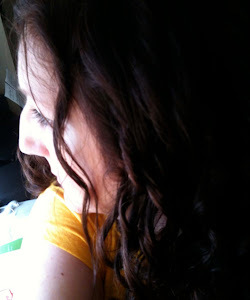 Take one out to double check that it's the right softness for you, by lopping off the top. If it needs more time pop the top back on and let stand to continue cooking from its own heat. If it's ready, quickly put all the eggs in cold water to stop them from cooking any further. I also added octopus wieners for a little extra fun and worked it into a story about Navy soldiers at sea etc etc. have darling wee egg cups. And of course ebay. And a whole blog dedicated to the wee little holders of warmth and goodness; egg cups. Check out the 'trendy' category; it's bound to fill you up with egg cup envy. Oh how I loved soft boiled eggs as a kid. My mother had these wonderful little spoons that fit just right inside. Next time I'm "home" I'm going to have to look for those precious spoons. Oh. 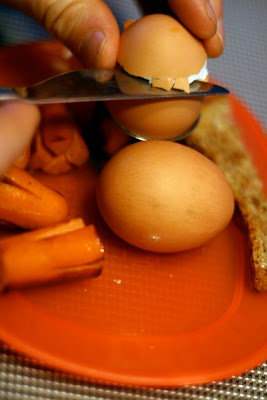 Egg spoons! How perfect. I really want to go shopping now.